Due to unexpected cancellation, there a couple spots now available. 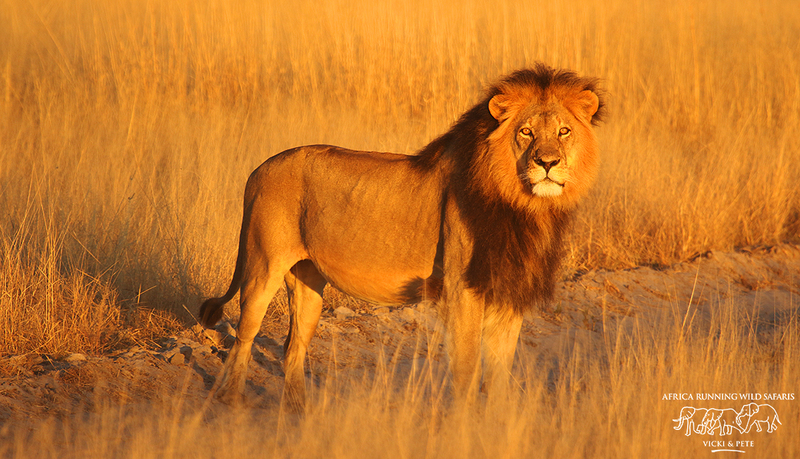 Botswana – Africa Running Wild Safaris love Botswana so much as it rich in abundance of wildlife. This is the special boat that we use and you have the best view from the river when the animals come down to drink.Notice the car in the far distance. It doesn’t have the same view as the boat gives you. Africa Running Wild Safaris will always use what we can to enhance your wildlife experience in Africa. Less than 8 people and the cost goes up s fraction more. * Note these prices are a ball park figure and may be subject to a small change as 2020 is a long way out.This is a guide and if there is a change it won’t be a significant change. 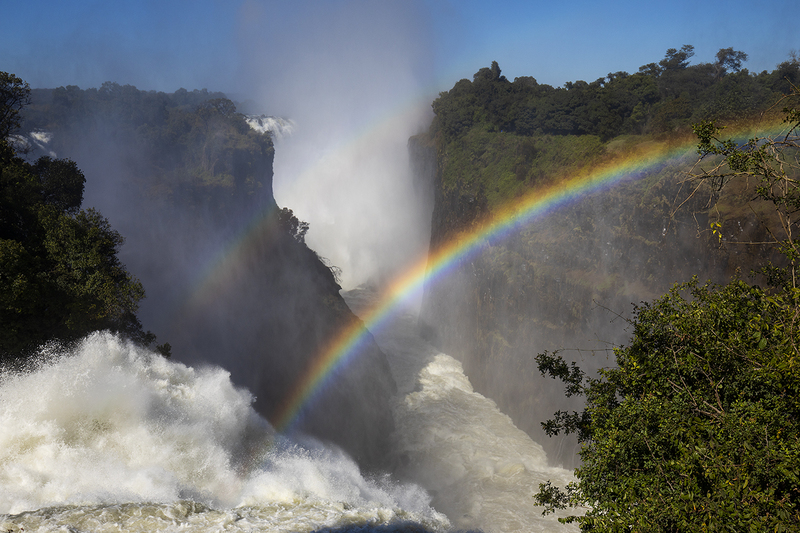 Botswana – Africa Running Wild Safaris is excited to show case our trip to Botswana which is an amazing place and like all of the countries in Africa , there are just so many places that you can visit, so many areas to explore. In each of our countries that we visit , we have chosen our highlights which if we were doing a trip on our own would visit these places as the number one place to go. Why is that? Simply because we believe it is best value for the African wildlife experience and Africa Running Wild Safaris has great joy in taking you there to give you the same uplifting experience that we get when we go to Africa ourselves. Accompanied by Australian Professional Photographers, Pete Dobré & Vicki FreerIf there are internal airfares they are included. *Please note it does not include any increases outside our control such as park fees, fuel surcharges if that should happen. Have you ever thought of a way to be able to get up close to the animals, to have the sensation as you are floating and not moving, where the air is quiet, where the breeze is gentle and where you don’t have to carry your gear and it’s right at your feet.? 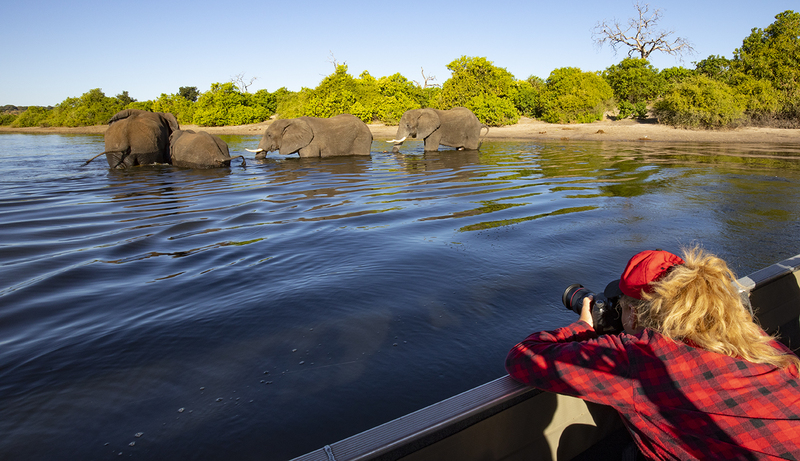 One such place we always visit in Botswana is the famous Chobe River which is a big part of what we do in Africa. We have a special boat that is made for 8 people. The seats that you sit on rotate 360 degrees and the tripod is connected to the seat. Our partners on the Chobe River supply you with camera, cards and lens if you don’t have your own. You can see how close we can drift and to see these magnificent animals crossing the Chobe River is awe inspiring. You don’t have to be a photographer to do any of our Botswana Africa Running Wild Safaris. We often have partners that join their partners on tour and either have no camera or might have a point and shoot camera and they are happy just to enjoy the experience, to sit back and take it all in. We also get birdies and photographers, a complete mixture. Below you will see some images of the boat and all of the pictures that you see below, are taken from the special designed boat that you get to travel on for the time that we are on the Chobe River. This would be the most relaxing event that we have ever done in Africa. This is a must and you will be left in awe and wonder. 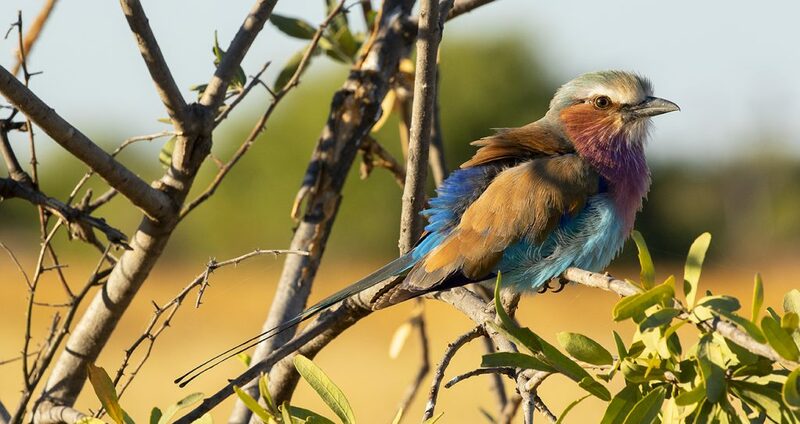 You’ll also experience the amazing Hwange National Park where your journey begins and this will set the scene for the other wildlife experience that you’ll have on Africa Running Wild Safaris. This comfortable and well-appointed lodge is nestled in a remote and untouched corner on the edge of Hwange National Park in a 5000 acre private reserve, and is famous for its impressive herds of elephant, not to mention many other spectacular species of wildlife. The main lodge is built on a spectacular viewing platform and overlooks the Bomani Pan. You can enjoy your breakfast while watching zebra and wildebeest quietly graze or as giraffe and elephant soak up the day’s last light.This is a great opportunity to observe wildlife at your front door. The days take in game viewing, where you will be taken to several other waterholes that are breath taking in terms of what you see. Wildlife in unpredictable but having said that, you will see the wildlife that will stir the inner self. Hwange is an amazing part of Africa and what is amazing about this country, you have so many secluded pockets hidden away which make the experience even more special. If there was one place in Africa that is my favorite off all from a photographer point of view, then Chobe National Park it is. As I mentioned earlier, our partners here are photographers themselves and they get us close in to the action where you can aim your point and shoot camera and you will still walk away with stunning pictures. It’s about the light and the light they all understand. This is a stunning part of the trip and I have NEVER had any guests who have not been blown away by this experience. Another shot taken from the boat as the elephants come down to the waters edge to drink. To secure your place and book, all you need to do is pay in a $1000 deposit i. Click the Add to cart. “Hi, my name is Roger and I am an unashamed Nikon user and enjoy photography as a hobby. My wife Pam and I travel overseas every year, mainly throughout Europe because we both enjoy that part of the world, but it has been an ambition of mine to travel to Africa for many years despite Pam having no desire to do so. We were visiting a travel expo early in 2017 and bumped into Pete just as we were leaving and after a few minutes of listening to him we knew his trip ticked all of the boxes. To be able to see all of the wildlife and learn about photography as well as being able to take Pam along, who isn’t a photographer, suited us well. Pam did have reservations about camping in tents etc, but Pete assured her it would be OK.
Over a year later we headed to Africa where we visited Victoria Falls, Zimbabwe, Chobe National Park and Khwai National Park, Botswana. Awesome is the only word to describe our experience. Everything was just awesome. The falls were breathtaking, the Pangolin tour boats were set up with amazing tripods for each person on the Chobe River, the safari vehicles in the Khwai National Park, the access and close proximity to wildlife, experienced tour guides with great local knowledge, the camp food just great. Every guide understood the needs of a photographer and where to position the boat or vehicle to take the best shots and make best use of the light. No rushing and plenty of time to take the shots you wanted. Plenty of room in the vehicles to slide from one side to the other and no need to carry your bag. While I was taking photos Pam enjoyed talking to the guides and being in the moment. She was a convert! We saw wildlife in situations that ‘normal’ tourist just wouldn’t get the opportunity to witness. So many photos , so many memories. Pete and Vicki were superb hosts and we really enjoyed their company along with our other companions. The learning experience for me was priceless and my photographic knowledge grew every day. Pete is an outstanding professional and has a patient, easy teaching style covering image capture and post processing. The whole adventure was thoroughly enjoyable and an experience Pam and I will never forget. Check out our Safari videos! © 2019 Africa Running Wild Safaris.